I didn’t watch this years 2009 BET Hip Hop Awards but I did see the Cypher online and these three murdered it and I thought this was actually worth posting today. Drake’s new video for “Forever” (not directed by Mr.West but rather Hype Williams). popped up earlier. I’m feeling this song and feel it’s features Kanye, Weezy and Eminem who probably has the hardest verse on there. O Yeh, the manchild himself, Lebron James, is in it too. Drake’s new song, Forever, has one hell of a backing. Kanye West, Lil’ Wayne and Eminem helps Drake make his imprint in this rap game. I personally like this song. Kanye black on the track as expected and It’s good to hear Eminem get back on his real rap flow and not that corny funny crap. Eminem gets a second chance to make a coming back into the game impression on the print side. 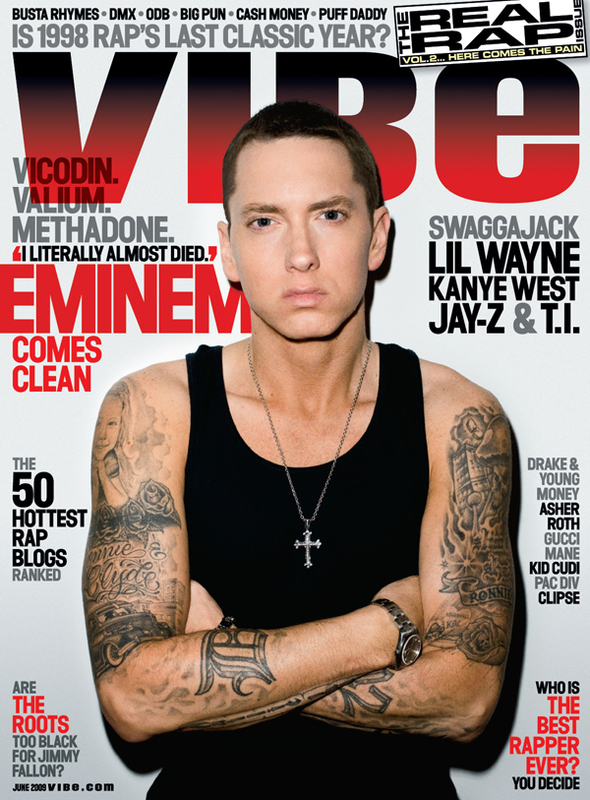 He will grace “The Real Rap Issue” of Vibe Magazine this month. The XXL covers were tooo photoshopped which made it look fake. This is the Eminem that I like to see. Tatted up with regular eyes. BTW: This actually looks like a good issue. Look at the features on the sides.